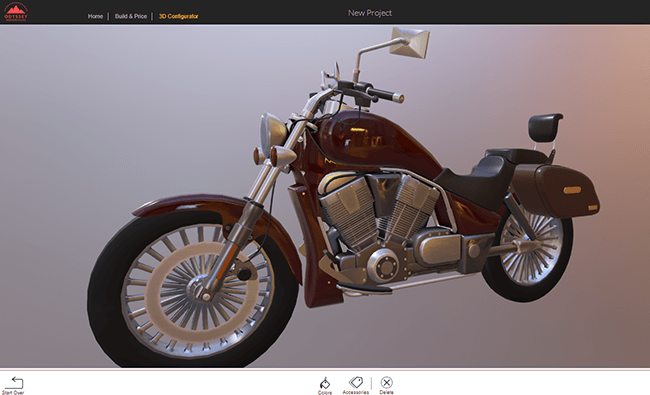 Picture this: You want to buy a customized motorcycle. To do this, you go to the dealership to test drive a variety of models, experience the different features you can purchase, and see the different paint colors for yourself. In other words, you want to see what you’re buying before making the investment. Without these visuals, you'll never really know what exactly it is you’re about to buy or if you’ll really be happy with it. And this is true for more than just buying a vehicle. In the age of Amazon and an on-demand economy, customers are increasingly turning to the web to get information, see products, and make purchases. If you want to meet those expectations, your online ordering experience needs to be top-notch. One way both retailers, manufacturers, and distributors of customizable products can stand out and create a memorable online customer experience is through product visualization. But what is it and how can it help your e-commerce efforts? Read on to learn more. Product visualization is the act of using renderings, images, and artwork to visually communicate your products to customers. Today, many companies do this by enabling their e-commerce websites with visual product configuration software. Through this method, customers can see a picture or rendering of the product while they're completing their orders online. How Does Product Visualization Software Work? Product visualization software is very simple. Once your customers start to select and customize one of your products in your e-commerce platform, the product visualization software shows customers a rendering, image, or piece of artwork of the product. In fact, to ensure the images shown are 100% accurate and update according to the customizations that are made, many product visualization tools are a part of a CPQ solution. For example, our own suite of CPQ tools offers a set of robust visual product configurators to ensure order accuracy and improve the customer experience. This includes depicting your products in 2D, 3D, or even virtual reality. And if you’re wondering how product visualization software knows what your product looks like, the software actually uses images and artist renderings that you upload to the system. The software also uses the dimensions you input into the system so that customers can get a better feel for the scale of your products as well. Want to see examples of product visualization in action? View our visual product configurator demonstrations. Why Do You Need Product Visualization Tools? #1 - Images are more effective selling tools than text. Because images are processed 60,000 times faster than text and help customers retain up to 65% of information (compared to just 10-20% of textualized information), product visualization is a vital tool that educates your customers during the ordering process. And because 64.8% of manufacturing shipments are from e-commerce orders, product visualization software is a must-have for any business that wants to succeed in today’s digital landscape. So, not only does product visualization educate your customers more than text, but it also improves the online ordering experience. #2 - Orders are less likely to disappoint customers. Orders made through visual product configurators are more likely to meet or exceed customer expectations, resulting in an increase in order accuracy and a decrease in costly returns. Why is that? Well, through visual configurations, your customers’ have a clear look at what they’re ordering, increasing the chance that they will be satisfied with their purchase. In fact, product visualization updates as customers customize their products, leading to real-time, accurate changes in the product’s appearance. Furthermore, if customers make customizations that are not possible to deliver or execute, the software will not allow the customization to be made, reducing errors. #3 - Product visualization differentiates your products from the competition. Lastly, but certainly not least, visual product configurators are a more impressive way to showcase your products than text-based product descriptions. And when customers compare your visualized products to that of your competitors, they will be blown away by the difference an image can make. Order accuracy. Customer satisfaction. Competitive advantage. Through product visualization, your company stands to gain a lot. At the end of the day, with more accurate visual representations of what your customers are purchasing, your customers will be more satisfied with the product they receive. So, don’t let this opportunity pass you by. See how product visualization can help your bottom line by requesting a demo of our Powertrak software.